KCC Egis upset Goyang Orions to regain the lead in the series. The guests took control from the first minutes by winning first half. But Goyang Orions won third quarter 23-17. However it was not enough to take a lead and get a victory that evening. The game was decided in the last minutes when KCC Egis won last quarter 25-23. KCC Egis outrebounded Goyang Orions 43-28 including a 31-20 advantage in defensive rebounds. The best player for the winners was American Brandon Brown (201-85, college: CS San Bernar.) who had a double-double by scoring 25 points, 18 rebounds and 6 assists. The former international forward Kyo-Chang Song (200-96) chipped in 18 points, 7 rebounds and 4 assists (on 8-of-10 shooting from the field). Brown is a former Eurobasket Summer League player, which is considered top international summer league in the market. At the other side the best for losing team was American power forward Darryl Monroe (201-86, college: George Mason) who recorded a double-double by scoring 21 points, 12 rebounds and 5 assists and the former international forward Il-Young Heo (197-85) added 21 points and 6 rebounds respectively. Both teams had four players each who scored in double figures. Both coaches used bench players in such tough game. KT Sonicboom fired past LG Sakers to stay alive in the quarterfinal series. Strangely LG Sakers outrebounded KT Sonicboom 44-30 including 22 on the offensive glass. They shot the lights out from three nailing 18 long-distance shots on high 60.0 percentage. 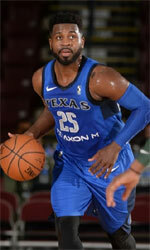 It was a good game for American forward Marcus Landry (201-85, college: Wisconsin) who led his team to a victory with 19 points and 7 rebounds. 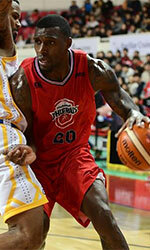 International guard Hoon Heo (181-95) contributed with 18 points and 5 assists for the winners. Five KT Sonicboom players scored in double figures. Central African-American power forward James Mays (205-86, college: Clemson) answered with a double-double by scoring 26 points and 15 rebounds and American point guard Joshia Gray (185-93, college: LSU) added 24 points and 7 rebounds in the effort for LG Sakers. Both coaches tested many bench players which allowed the starters a little rest for the next games.